I like almost every one of your looks, but sometimes I wonder... Why do you always have kind of a sad expression on your face? I mean, your mouth, it is always like you're squeezing your lips. I wonder how nice your smile is, cuz you're so handsome and have such a nice face. you are really my favorite when it comes to corporate casual! always perfect! 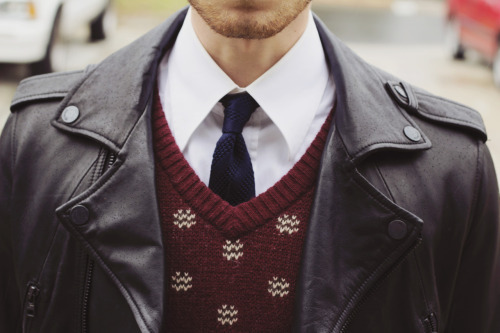 I love that you paired such a dapper preppy look with the edge of the leather jacket! Brilliant. Yeah!! love the look, love the formal look blended with this wondeful perfecto, handsome! Oh my, how can a man be so beautiful? I adore your style, its very classy, yet modern. And it suits you very well too. you reminded me of Shia Labeouf in that one Indiana Jones movie... Hot jacket! Looks like I'm going to have to call the exorcist. We can even make a movie out of it. Biker Jaket by Ichy Rizki A. CHECK OUT THE GIF IN DESCRIPTION !